Are 3-D printer designs protected by the First Amendment? 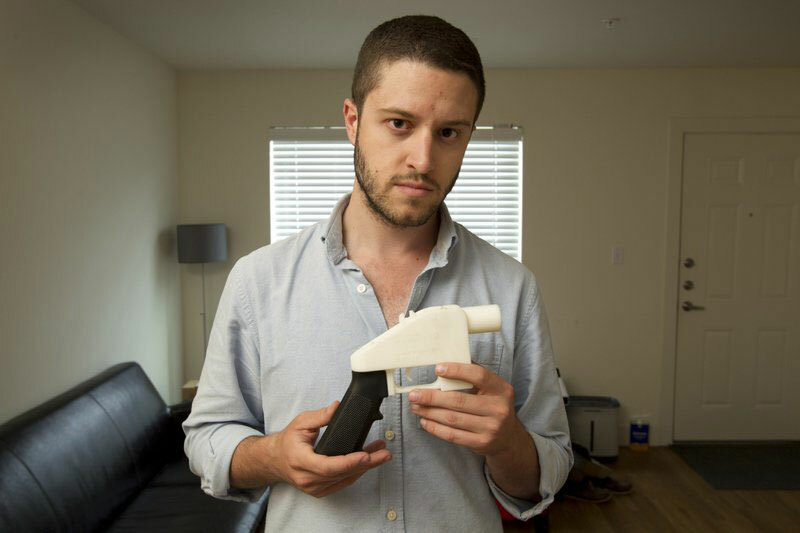 This was the legal defense raised by Cody Wilson back in 2015, who faced prosecution for violating federal gun export laws after he created a gun with a 3-D printer and then posted the blueprints online for others to download and use. Wilson claimed that this violated his right to share information freely. The State Department settled its case against him in July 2018, and for a few days Wilson was able to distribute the blueprints on his website and revel in his success at using the First Amendment to protect the Second Amendment. But by the end of last week, attorneys general in 20 states had filed suit against both the State Department and Wilson, in an effort to force the State Department to rescind its settlement. The states raised a constitutional claim of their own — that the settlement violated the 10th Amendment, which gives states the right to make their own laws, including those governing gun control. Earlier this week, a federal judge issued a temporary restraining order blocking the government from allowing the blueprints to be distributed. A follow-up hearing will take place on August 10. What does all this mean, aside from an amazing day for Bill of Rights bingo? The NRA’s official statements have been along the lines of, “absolutely nothing,” pointing out how prohibitively expensive printing a gun is at this time. It’s true that we’re unlikely to witness the rise of a 3-D printer armed militia in the next couple of weeks. But this also sidesteps the real issue. Right now, 3-D printers are expensive and clunky, but they won’t always be. How should we deal with a world where the technology has caught up with Wilson’s aspirations? That cuts to the heart of the issue — the danger inherent in a world where absolutely anyone can manufacture their own gun — but it’s not quite the right analogy. The First Amendment may not protect your right to yell “Fire!” in a crowded theater. But it does protect the right to publish something like the “Anarchist Cookbook,” which contains instructions for manufacturing explosives. It may be illegal to build your own bomb, but the government can’t censor the instructions for doing so. And to add another wrinkle: At this time, making your own gun at home actually is legal, provided that you don’t intend to sell it and you aren’t otherwise prohibited from owning one. Kits that let you assemble your own firearm have existed for years and are legally available. Benson goes on to express skepticism at the proposed solutions to this, observing that, “Banning people from doing things that are already illegal through other means strikes me as mostly symbolic.” Fair point. It’s already illegal for convicted criminals to manufacture their own guns, whether it’s using a 3-D printer, a kit or a garage-based gunsmithery. There are a few different approaches we can take here. We can argue that it’s not protected by the First Amendment. However, whether or not code counts as speech remains an open question. We can consider the blueprints to be speech — but still regulate their dissemination. It’s a bit of an overstatement to say that the First Amendment protects speech from any government interference. The government can regulate political speech if that regulation is narrowly tailored to achieve a compelling government interest. It can regulate commercial speech as long as its laws are substantially related to an important government interest. Banning anyone from posting 3-D gun designs online isn’t exactly a “narrow” regulation, but you could argue that a gun blueprint is essentially a commercial product, and that banning someone from posting one is the only way to keep guns out of the hands of people who shouldn’t have them — an important government interest if there ever one was. We can allow the blueprints to be distributed freely, but regulate the hell out of 3-D printers. The First Amendment protects speech, but doesn’t stop the government from regulating conduct. In this case, that might mean licensing the usage of 3-D printers, or the components and materials necessary to print a gun. None of these are perfect solutions. How could they be, when the implications of 3-D printing technology are so complicated? The issue’s not going away, and it’s not just about guns. It’s about how the lines between speech and conduct and information and action, are growing increasingly blurry. Lata Nott is executive director of the First Amendment Center of the Freedom Forum Institute. Contact her via email at lnott@freedomforum.org, or follow her on Twitter at @LataNott. This entry was posted in Freedom of Speech, Inside the First Amendment, News and tagged freedom of speech, Inside the First Amendment by Lata Nott. Bookmark the permalink.